Father & Son means QUALITY LOW COST MOVING! We are a family-owned business, dedicated to providing professional and personal service. Father & Son specializes in local, statewide, long distance moving, Office relocation, truck rentals, small moves, self services movers, and more. All moves are performed by our quality trained professionals, who handle your moving needs from start to finish. Father & Son has been dedicated to quality low cost moving since it was founded in 1908. At this moving company, our experienced sales representatives work with you, your family or business to ensure every detail is covered. Our total quality control, along with our commitment to your satisfaction, has made Father & Son Moving & Storage one of the top-rated storage and moving companies in America! 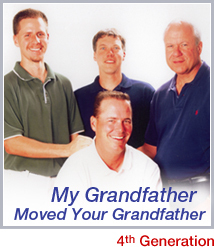 "This was the first time is ever used a moving company, and, next time I will definitely use Father & Son again! The men came to my home, moved my belongings and were so polite. They worked so quickly, I couldn't believe how fast the movers were done! they even set up all of my furniture and put my bed together for me. Thank you Father & Son"